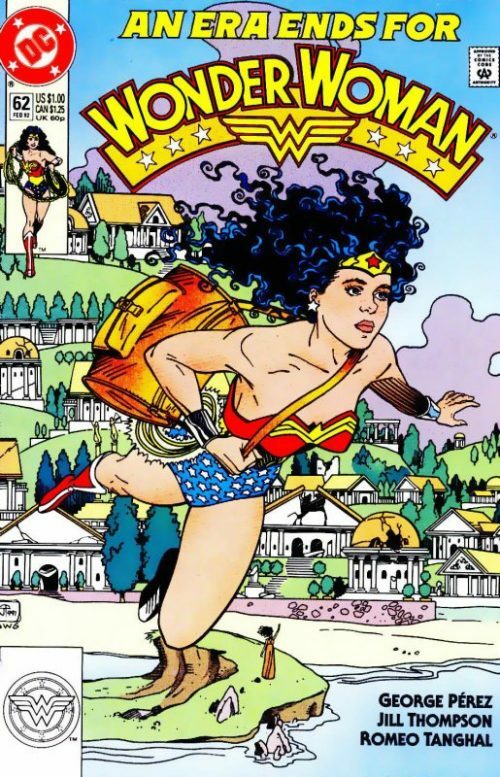 As the cover states, this issue marks the end of an era for Wonder Woman as George Perez hands over creative reigns to new writer William Messner-Loebs. 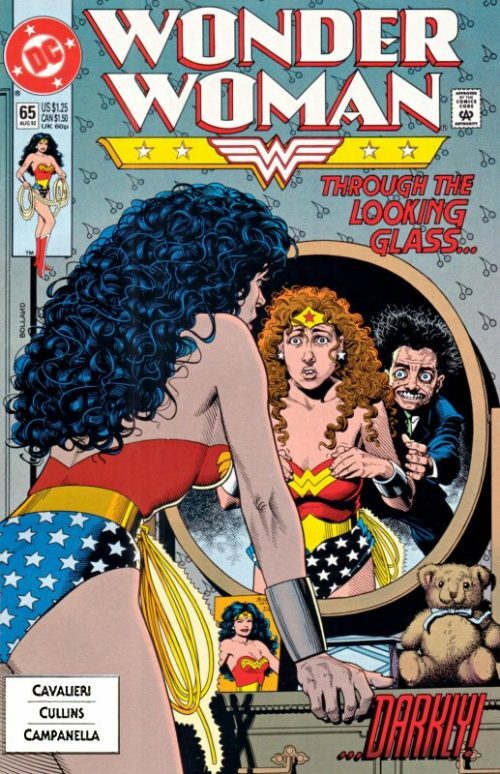 After five years, Perez has truly made the character his own and holds the lofty title as the man responsible for re-defining Wonder Woman in the post crisis universe, disposing of many elements that made the pre-crisis version so iconic but simultaneously bringing Diana into a modern age and truly defining her mission in life. 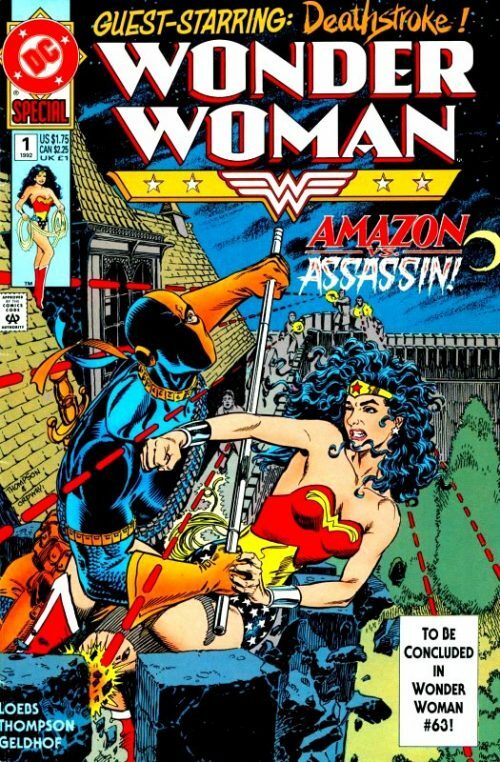 Fans to this day are still divided as to whether they see the Perez run as the greatest ever on the Wonder Woman book. Traditionalists hated that her Diana Prince identity had been discarded…that she could fly like superman and no longer needed an invisible jet…that she no longer lost her strength when chained by a man…etc. 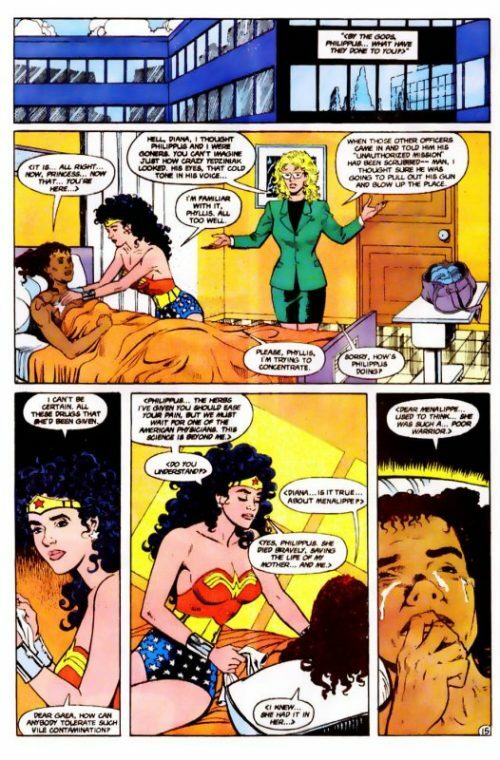 But fans of Perez loved the fact that Perez intertwined the real Greek myths and gave Diana a voice at last…a true heroine with a clear vision of what her purpose was as opposed to a glorified secretary for the JLA or always playing the “damsel in distress” to either Superman or Batman. Wonder Woman has finally been elevated in status to a true power house of the DC universe and set the stage for her to take her place as part of DC’s iconic “Trinity”. Whatever their opinions though, nearly all fans acknowledged that Perez genuinely loved Diana and this came through loud and clear in everything he did. He brought maturity to the book and gave Diana for the first time a supporting cast with substance. While some felt his swan song “War of the Gods” had not been his finest moment, this issue serves never-the-less to tidy up the loose ends and set Diana on a new path for her future. Future creative teams would discard the “mythical” elements and make Wonder Woman more of a run of the mill “super heroine” but she could never stray too far from her roots and the basic Perez elements could always be seen beneath the surface, bringing a cohesiveness to the book that had never really been present during the pre- crisis era. This issue has a definite feeling of the baton being passed on and there is almost a hint of Perez gently warning the new creative team not to stray from the foundations he had built over the previous five years. 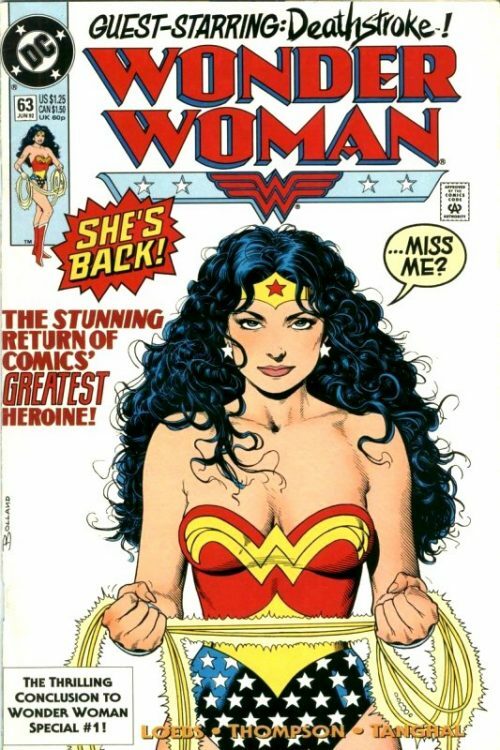 Touchingly, the final page of this issue features a letter from Perez addressed to Diana herself, making clear his feelings on having been a part of arguably one of the most iconic heroines ever created. He wrote “I’d like to think that I’m a better person for having followed your adventures. The issue that follows this one is a “Wonder Woman Special” and the story then continues back in the normal title with numbering continuing from issue 63 onward. Wonder Woman flies through the skies making her way back to America. As she travels she reflects back on all the recent events and their ramifications. The War of the Gods is finally over but at a great price. Sometimes the measure of a victory is not what you win but how much you are prepared to lose, she muses. She thinks how strange it feels to travel back to Patriarch’s World as she has done many times previously, but this time there is no Wall of Chaos to traverse. Themyscira is now on the map. Wonder Woman reminds herself to ask the cartographers exactly where the island is now situated in relation to other countries because it is difficult to get your bearings when one does not know where one started from! She spies a coastline below and recognises Greece, smiling that her mother would have found it reassuring to know that the Amazons had never been that far from their ancestral home after all! A concerned Diana had asked her mother if she was now feeling better and an embarrassed Hippolyta had asked her daughter not to fret over her…especially in front of the assembled guests! 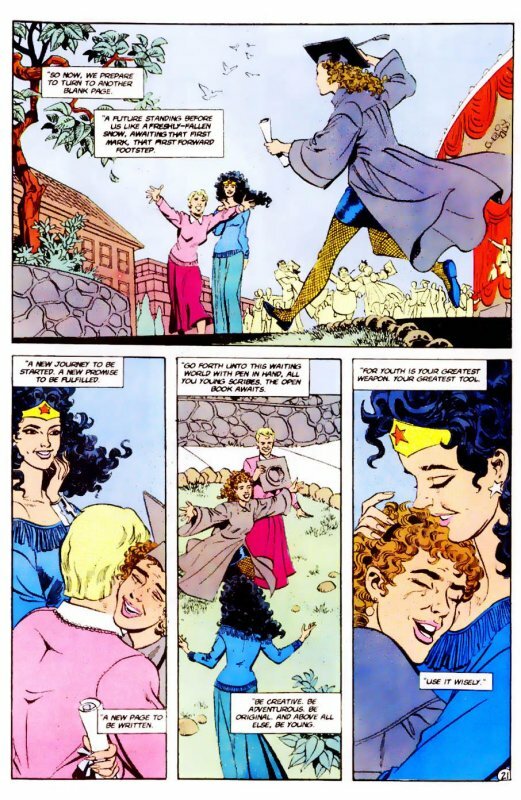 Mother and daughter had then hugged each other and Diana had told Hippolyta that she was as headstrong as ever… and it was wonderful to see! For her part, the Amazon Queen had replied that Diana was definitely her mother’s daughter in that respect! She had then turned to the other Amazons and said that there was much work to be done if they were to rebuild the shattered remains of Themyscira. Hippolyta had turned to the super heroes and thanked them on behalf of the Amazons for their help during the crisis. But now their work here was done and it was time for the Amazons to take control of their own destiny again. Hawkwoman had replied that she would like to stay and help. She had reminded the Queen that the island was no longer isolated – for better or for worse – and they would need friends from Patriarch’s World more than ever. She had added that while there were many scary people on this planet, the Amazons had many friends out there too. “We’re all sisters now.” she had smiled and seeing Hawkman’s expression had added”…and brothers!”. Suddenly Hippolyta had swooned and a concerned Wonder Woman had rushed to catch her. Epione had assured Diana that the Queen was fine and that although Circe’s death had diminished the spell’s effect, Hippolyta still required much rest and treatment. Epione had said that she would take the Queen back over to the Island of Healing and Diana had replied that she would fly her mother there herself. Elsewhere the world watches a TV broadcast as the U.S. President gives a live address at the U.N. He makes clear how sorry America is for having blamed the Amazons and that they now admit they had made a grievous mistake. The world had been taken in by a well planned attempt to smear a government whose only desire was peace and equality. After many days of closed door testimony by three dozen of Earth’s greatest heroes, the U.S. have irrefutable proof that Themyscira is totally without culpability for the terrorism perpetrated in its name. The Amazons are innocent. In their home, Steve and Etta lie on their bed watching the address. Etta is pleased that it has at last been made official but Steve worries that the rest of the U.N. still has to forgive and forget too. Surprised at his negativity, she turns to him and says that she thought he would have been relieved. She certainly is. He says that he is, but it just seems too neat that everything has turned around so quickly. Perhaps it his just his paranoia. She hugs him and says that she can understand his ambivalence, especially after everything that had happened at Hanscom Air Force Base earlier…but it is all over now. They both reflect back on the day before when they had been escorted to the Court Martial Hearing. They had passed another guard in the corridor taking a sullen faced General Yedziniak in the other direction. They had saluted him but he had barely acknowledged them and judging by his expression, it seemed clear things had not gone well for him at the hearing. As they were taken inside the office they had been greeted by General Hillary and a General Chalmers. Chalmers had told them that they were both here to answer some questions pertaining to the attempted bombing raid on Themyscira under charges of espionage and violation of Air force regulation 205-1 – the Information Security Program…. While Steve and Etta continue to reflect on these events, Julia and Vanessa are at home and while the young girl watches the TV broadcast too, her mother speaks on the phone with her own mother Maria Deneiros in Greece. Julia assures her mother that Vanessa is fine now and is enthralled with what is going on at the moment. “Sometimes I marvel at the resiliency of Childhood!” she remarks. Maria replies that “old folk” can be quite tough too and explains how her husband, Agostos, seems to have discovered a new leash of life ever since Circe’s island had blown up when Olympus had finally vanished from the skies overhead. Stavros had told her how all the Wonder Woman cultists on the island were already dead and there had been no one left to save – and they had only just managed to escape in time themselves! Maria adds that the poor cultists had only been children and that their death had been a tragedy. Julia then asks Vanessa to say hello to her grandmother but the young girl complains that her greek is still very rusty. Her mother replies that she will not take no for an answer and a reluctant Vanessa takes the phone and in pigeon Greek speaks to Maria, while Julia turns her own attention back to the TV set. An image of Wonder Woman appears as the President explains that a meeting has been initiated with Princess Diana, who is representing her country while Queen Hippolyta recovers from illness. Of course this role is nothing new to the Princess and indeed, the world would never have known of the Amazon Nation and all of its benefits if not for Wonder Woman. Even when her reputation was sullied and her goals jeopardised, she remained undaunted. “Our troubled world can ill afford to lose such a tenacious ally”. In his old office at police HQ, Ed Indelicato watches the same broadcast nodding in agreement while he packs up his things. He takes a photo off the wall which shows him in uniform standing next to his former partner, Mike Shands. He ponders that if only they had listened to Diana when they had had the chance. But he also remembers how he himself had failed to listen to Mike – and what that had cost him. The Amazons had gathered around where Menalippe and the other fallen Amazons lay and Diana had addressed those present, thanking the super heroes for also attending the ceremony to pay their respects. The Princess had then performed the solemn ritual as the torches had ignited the pyre, sending Menalippe and the others on their final journey to the Afterlife in the Elysian Fields. Tears had fallen down the sorrowful Diana’s cheeks as she had bid them farewell. Later after the ceremony, Wonder Woman and Hawkwoman had strolled along the beach deep in conversation. Shayera had suggested that Diana should integrate herself with the rest of the super hero community. Seeing Wonder Woman’s reaction, she had added that Diana could stay on and act as an advisor to her mother, although it would be a great waste of her unique talents. 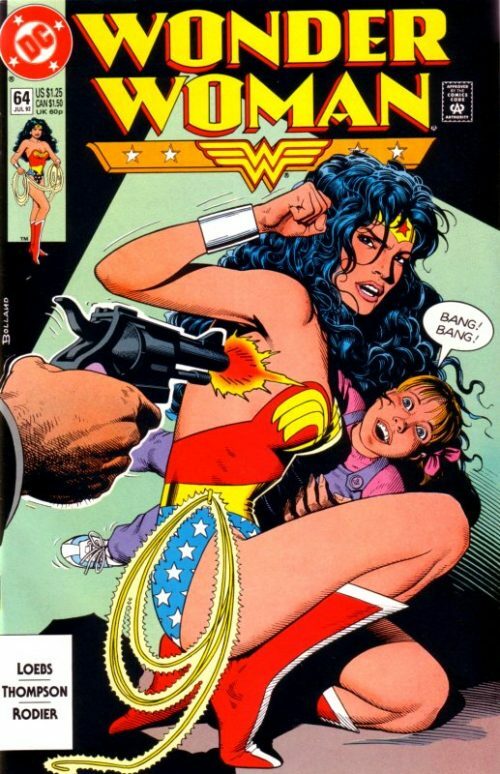 Wonder Woman had replied that the idea of her becoming a crime fighter and to actively seek out violence would only compromise her ideals surely. Shayera had responded that first Diana had to reestablish and fortify her place in the super hero community. “We can use you” she had told Diana. She had added that when the other Amazons start to travel around the world freely, Wonder Woman’s place would no longer be unique. None of the other heroes actively seeked out violence and their goal was to preserve the peace – albeit some of them at times got carried away! And that is where Diana could make a difference – to remind the other heroes of the ideals they have all sworn to protect. “Maybe it’s time you thought of getting a place of your own too” she had added. Wonder Woman had suddenly dropped to her knees and a concerned Shayera had thought that she had perhaps gone too far and upset Diana. But the Amazon Princess had replied that she simply could think more clearly when down here. She had gathered up some of the sandy clay and had told Hawkwoman how she had been born on this beach – and then reborn. It was also here that they had buried Lord Hermes. She had used to relish his mellifluous voice and had ached when he had withheld it. Now the song was silenced forever. It had only been a few days but she truly missed him. General Hillary had told Etta that he held a sworn affidavit signed by her, stating that she had deliberately used secure government channels to warn the Amazons of the impending attack by American fighters. “Is that true Lieutenant?” he had then asked her outright. Etta had replied “Not quite” and had explained that the Amazons had no receiving device and that the warning message had not been intended for them. Hillary had continued that regardless of who she had meant to contact, the fact was that civilian crime fighters had managed to receive the signal in order to prevent the bombing raid. He had then asked Etta whether she had been given explicit orders to deliver such a transmission? “No Sir.” she had replied. “Incorrect Lieutenant” he had responded. He had then told the surprised Steve and Etta that General Yedziniak had just confirmed himself that he had given the order to Etta, upon realising that an accidental attack order had been given to the pilots. In the event that a Public Enquiry might prove delicate and counter-productive to the Nation’s interest, the Air force had therefore decided to rule that there had been no violation of regulations. Etta and Steve had been acquitted! In their apartment now, Etta tells a still skeptical Steve that surely it does not matter why Yedziniak had signed the phony affidavit. What matters is that they had both been exonerated. Steve replies that he gets tired of playing by the Air Force’s rules – especially when they make them up as they go along! It is clear that the authorities must have threatened Yedziniak with something. Maybe he acted without orders. Maybe he knew it was either their way or the highway. Or maybe they have got something planned for Themyscira…something that requires America strengthening their political ties with the Amazons. But it makes no sense. Themyscira has no strategic value or modern weaponry. Etta tells Steve to stop obsessing about it and reminds him that the Air Force is her life and that she cannot go against it. “Don’t make me choose.” He reassures her that he will not – and that perhaps he is just too old to play these games anymore. She hugs him as he confirms his decision to resign from the Air Force for good this time. He had only re-enlisted because he had been afraid what might happen to Etta when the Gulf War had erupted. He now realises how wrong that was. He then tells her that as her “husband” and a former officer, he must respect the fact that her job will always require some level of risk. A shocked Etta asks “Did you just say husband?” and he nods, asking her to marry him as life is too short to be apart from her. Meanwhile the TV shows images of a casket being loaded onto an plane as the announcer states that the body of Hellene is to be flown back to her island home. He continues that perhaps some consolation can be found in the news that Amazon Captain Philippus, presumed dead, has been reported alive and under the care of government physicians. At the hospital, an overjoyed Philippus, lying in her bed, greets Wonder Woman as Phyllis Haller explains how she had thought the both of them “were goners”, considering just how crazy General Yedziniak had looked when he had been lead away. When several officers had entered the secret facility and told him that his “unauthorised mission” had been scrubbed, she had been sure he was going to pull out a gun and shoot them both. Wonder Woman meanwhile concentrates on trying to heal her sister. She tells Philippus that the herbs she has given her should ease her pain, but they must wait for one of the American Physicians. The Amazon Captain weakly asks if the news about Menalippe is true. 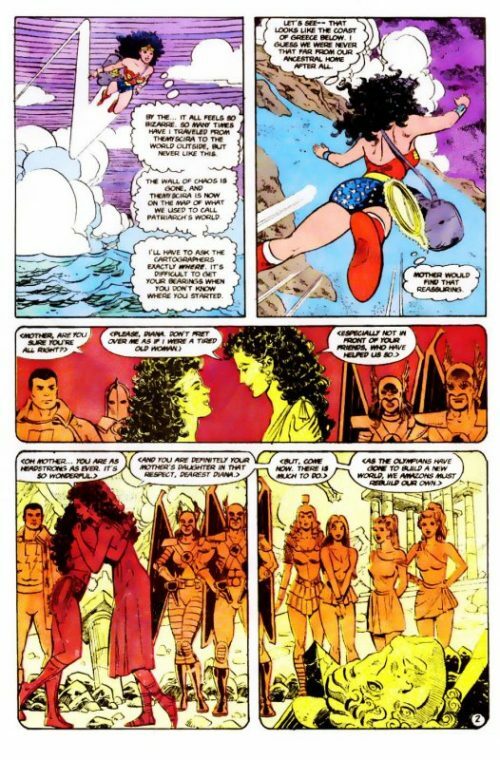 Diana nods sadly, telling her friend that the Oracle had died bravely to save the life of Hippolyta…and Diana herself. As Phillipus weeps, she tells the Amazon Princess that she always knew Menalippe had it in her…”but Menalippe always considered herself such a poor warrior”. Wonder Woman again reflects back to her last hours on Themyscira as she attended to her mother on the Island of Healing. Hippolyta could see that Diana’s super hero friends had given her daughter much to think about. Wonder Woman had told her mother that although she had lived amongst the outworlders for some time, it felt somehow different now. Before, it had always been reassuring to know that whenever things had become onerous for her out there, Diana could always find refuge back here on Themyscira. “And now that refuge is not the impenetrable fortress it once was, eh?” Hippolyta had responded understandingly. Elsewhere, Ed indelicato returns home from the office to find his apartment block is on fire! As fire trucks attend to the blaze he tries to race into the building but is held back by a fire officer, who asks him what on earth is worth dying for inside? A distraught Ed explains that his entire future is inside… the book he had been writing…that he had been sweating over for the past five tears! He even had a movie studio interested in filming it, but now his dreams have all gone up in smoke – literally! Across town at Vanessa’s school, Julia waits nervously outside the hall where the Graduation Ceremony is about to take place. She hears a familiar voice call her name and overjoyed, turns to see Diana standing there smiling back, dressed in casual clothing. The two women hug each other warmly as Diana says she hopes she is not too late. Julia assures her she is not and the Amazon Princess tells her mentor that there is so much she has to talk to about – especially the future. The Professor replies that the future can keep for now and that all that matters is that they savour the present. Many miles away on Themyscira, Hippolyta sits on the shore watching a group of Amazons offshore in boats, throwing the ashes of their fallen sisters into the ocean. Iphthime asks the Queen if the Amazons will ever truly know peace again? Will life in Themyscira ever be normal again? Hippolyta replies that Iphthime’s questions are best answered by an Oracle. The role of a Queen is simply to be prepared for what ever lies ahead. Iphthime then asks how she proposes to do that? Hippolyta replies that she will do so by keeping an open mind. The Amazons cannot allow pride to blind them to the knowledge that awaits them out there. Diana has taught her that. It is night time at the offices of the Mayer Publicist Agency, as Christine Fenton sits behind her desk and apologises for keeping her assistant Deni Hayes back so late. Deni says she is fine with it and understands that deadlines are part of the business. Chrissie asks if she has had any luck contacting Julia and Diana at home, but is told no. She tells Deni to go ahead and Fed Ex the letter to them as a courtesy. Chrissie explains to Deni that it concerns the “Wonder Woman” comic that they license and the imminent change in it’s creative personnel. “The writer wanted to say goodbye” muses Chrissie. “Some people just get so attached to a project”.